Green smoothies are a healthy addition to your diet, no matter how healthfully—or unhealthfully—you already eat. 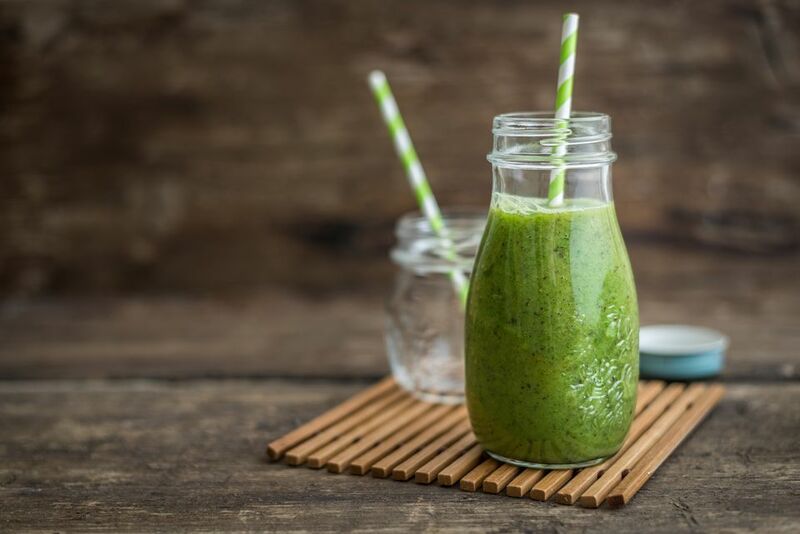 This simple green smoothie recipe is made with mango, orange juice, banana and spinach and sweetened with honey. If you prefer not to use honey, agave nectar makes a good substitute to sweeten it up a bit, but you may also find that you don't need a thing to make it sweeter. Add a bit more or less liquid to get your desired consistency. When possible, choose organic to avoid having pesticides and chemicals wind up in your smoothie. For a little fiber, add chia seeds or flax seeds. For protein try spirulina, chlorella, nuts, or seeds, such as almonds, walnuts or brazil nuts. Fiber and protein will keep you full longer, which is good if you're having a green smoothie for breakfast. If you prefer not to use honey, agave nectar makes a good substitute to sweeten it up a bit, but you may also find that you don't need a thing to make it sweeter, as this smoothie is naturally pretty sweet, to begin with. Mangoes are one of the sweeter fruits, and one mango contains 46 grams of naturally-occurring sugar. While that may seem like tons of sugar, naturally occurring sugar from fruit is not usually something to be too concerned about. Mangoes are packed with vitamins, minerals, and fiber, so they're a healthy source of sugar. It's added sugars, found in foods such as candy, baked goods and processed, sugary snacks that don't have much nutritional value but are loaded with empty calories. Adding greens, such as spinach or kale, is a great way to boost the nutritional value of your smoothie. And you can't even taste it with the sweetness of the fruit, making it a great option for picky eaters.